Often, the most memorable parties are the ones with the most outrageous themes. So if you are planning a birthday, anniversary, or just a regular bash that will go down in your town history as one of the best parties ever, then you should start preparing for a carnival-themed party event. 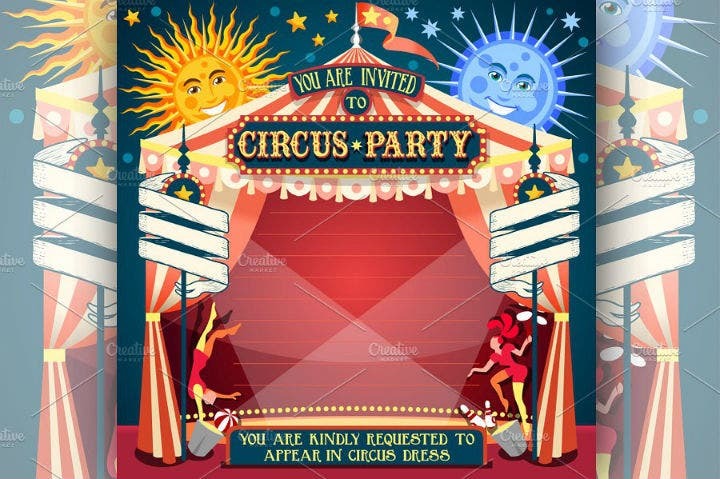 And as the party organizer or head honcho, you should also make sure that you send guests a matching carnival party invitation card. In this article, we provide different examples of carnival party invitation templates that anyone can you for their party of a lifetime. We will also provide tips on how you can better use party invitation templates to make your life easier. 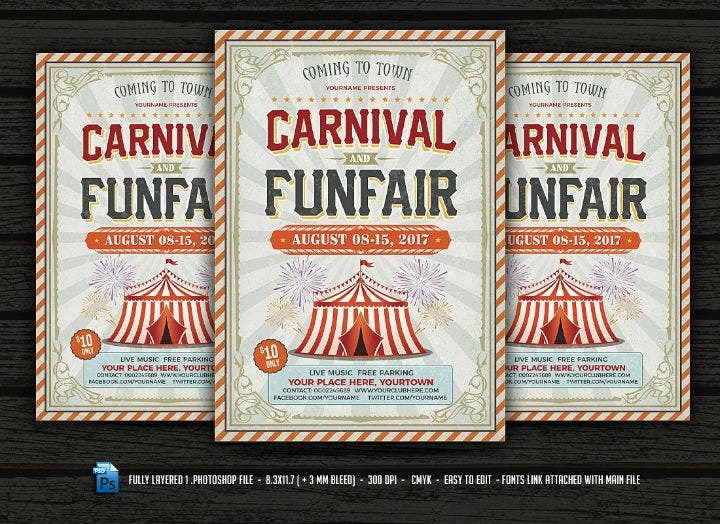 As promised, we have embedded fifteen printable invitation card templates fit for a carnival party. Feel free to browse through the different examples and be inspired into transforming these templates into original invites that only you could create. As a side note, make sure to have a compatible graphic design software program installed on your computer before you edit these templates. When it comes to party planning, there can be a lot of themes and concepts that will pop up and be suggested during the brainstorming stage. That is why if you have chosen to host a carnival-themed party, you may have done so because you want the event to make a splash in your local events scene or you just want to have an enjoyable and memorable time. But to truly have an enjoyable party, you need to plan for even the littlest detail. And that includes the use of party invitation cards. Invitation cards are needed to ensure that your guests know about the party and how and when to get there. Creating physical party invitation cards is also preferable if you want your guests to know that you are serious about the party and its festive theme. So if you are still on the fence whether to manually handcraft your party invitation cards or to use pre-made invitation card templates, we have prepared a short list of the different advantages of using carnival party invitation card templates. Read through them and, hopefully, you will be convinced of the practicality and convenience the use of pre-formatted party invitation card templates will offer you. 1. They are creative and unique. Planning a carnival-themed party can quickly drain anyone’s creative juices away. A workaround this is to utilize well-designed invitation card templates that you can use for your party. This way you do not have to rack your brains into creating that one unique invitation card and risk getting burned out before your party actually starts. Most pre-made card invitation templates are created by professional graphic artists so you are reassured that these card templates were created according to the latest graphic design industry standards. In addition, you (the end-user) also still retain the creative rights on how the final invitation card template will look like since you can still edit the template after purchasing. The good thing is that you do not have to take care of the entire invitation card designing process. The end-user can save some brain cells and time in this aspect. 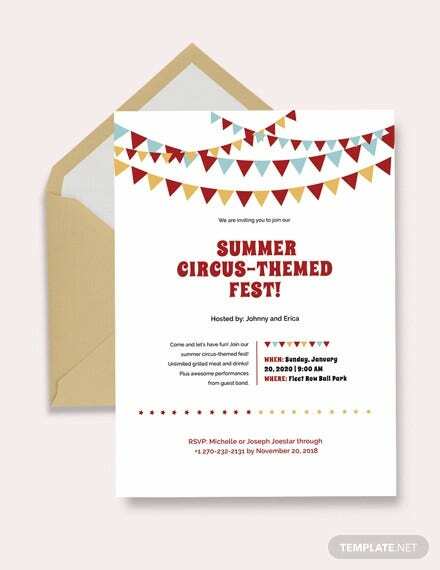 Another advantage of using pre-made carnival party invitation card templates is that these printable templates only cost a few dollars (typically between $3 to $20). This is helpful for those who want to save money by creating event invitation cards without sacrificing the quality of the invitation designs and other party amenities. This factor is also a major draw for people who are planning to have a large party attended by a lot of people. By using affordable pre-made carnival party invitation card templates, they are able to print out a large number of these invitation cards. Without having to worry about the possible cost of creating actual printed invitation cards, you (the party host) can then focus on other aspects of planning the event. 3. They are fully customizable. As we have mentioned earlier, most pre-made invitation card templates are editable. This means that you have the freedom to add, remove, or modify certain graphic design elements on the invitation card template that you may not like or are not satisfied with. 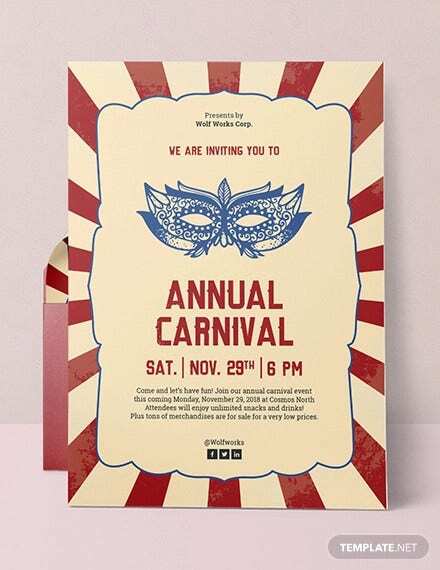 Carnival party invitation cards available as Illustrator, Photoshop, and InDesign templates often offer the best customization capabilities. So make sure to choose card templates available in these formats. You may still use other pre-made invitation card design template file types like PDF, DOC, or PUB but be prepared that they may not be as flexible in terms of making template design changes. These kinds of invitation template files are perfect for those who are already satisfied with the original invitation card template design that they have chosen. However, if you wish to make improvements to the invitation template, choose a template that is available in the more advanced formats. 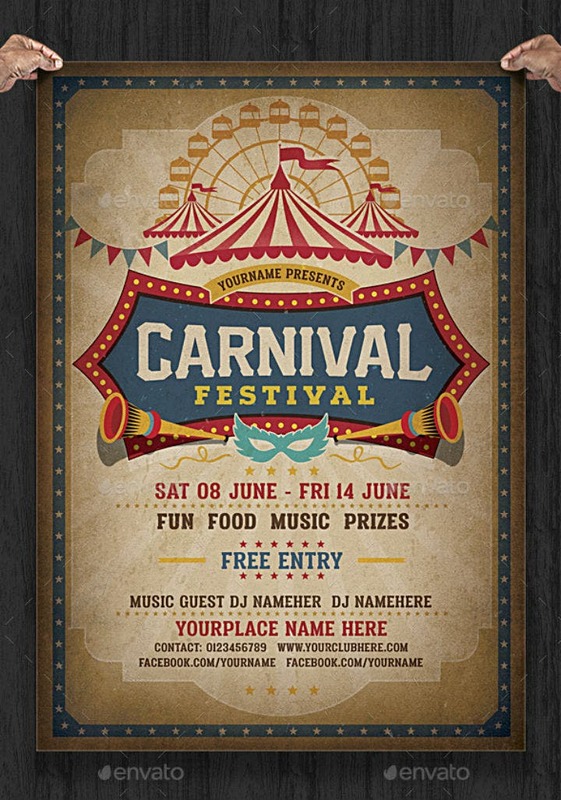 A major advantage of using pre-made carnival party invitation templates is their reusability. Pre-made card templates are digital files that can be stored on your computer’s hard drive or any kind of storage device for a long time unless you delete it or the file gets corrupted. This means that you can reuse the invitation template for another party or celebration following the same event theme. 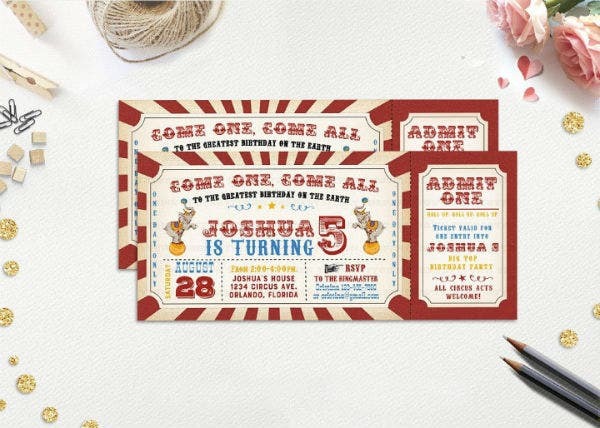 And even if you are no longer planning a carnival party the next time, this invitation card template may still be used as a template base which you can use to create other more creative party invitation template designs. Also, you do not have to pay for the invitation card template again. After that initial purchase, the template is yours forever. Pre-made party invitation card templates can help you save a ton of time when it comes to planning a themed party. This is because you do not have to create the whole card template from scratch. You also do not need to think about the graphic design elements to put in or remove. You will just use the pre-made template design that you like, make the necessary edits, and print out the template. It’s that simple. This way you can then free up time for doing other more important things related to the upcoming carnival party. 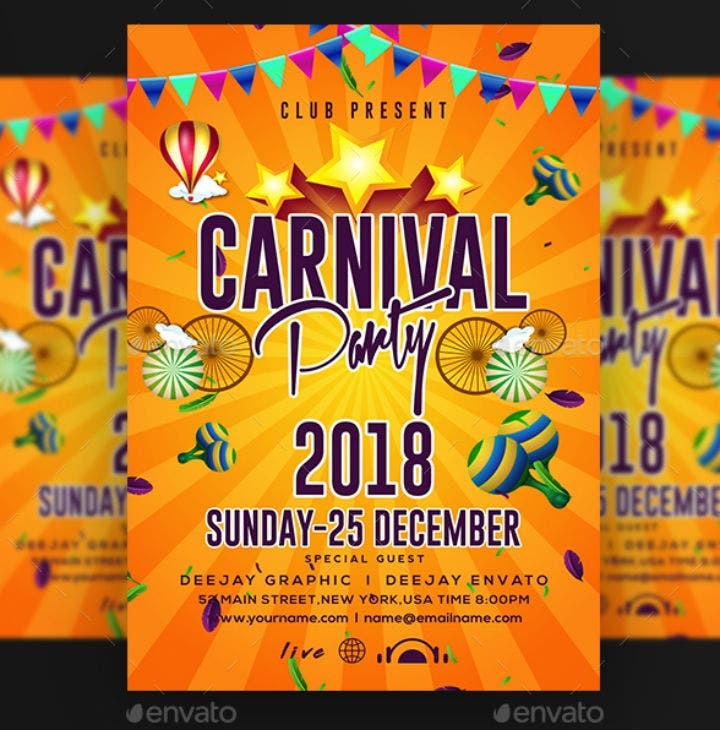 Aside from freeing up time for doing other tasks related to your upcoming carnival party, using different pre-made printable card templates will also help you save time in learning how to use different graphic design software tools. For instance, you do not have to invest time in studying intensive Photoshop tutorials since you do not need super advanced skills in editing these pre-made templates. 3. They can help relieve stress. A lesser-known advantage of using pre-made party invitation card templates is that their use can actually help you de-stress. This happens because you have fewer things to think about while planning for a party. Also, art helps people calm down. So when you are editing or customizing the printable invitation card template, you are expressing yourself and releasing all your worries away. Party planning entails a lot of things and will also cause a lot of stress. So if you are the party organizer or host, you should make sure that you are in a prime condition to plan the party and to execute it. Nothing is more depressing than not being able to attend the party or celebration that you have meticulously planned for the last few weeks or months. Granted, this specific benefit may not apply to everyone. But it is still worth a try. After all, you do not want to be a stressed out party host, right? 4. They help you hone your editing skills. 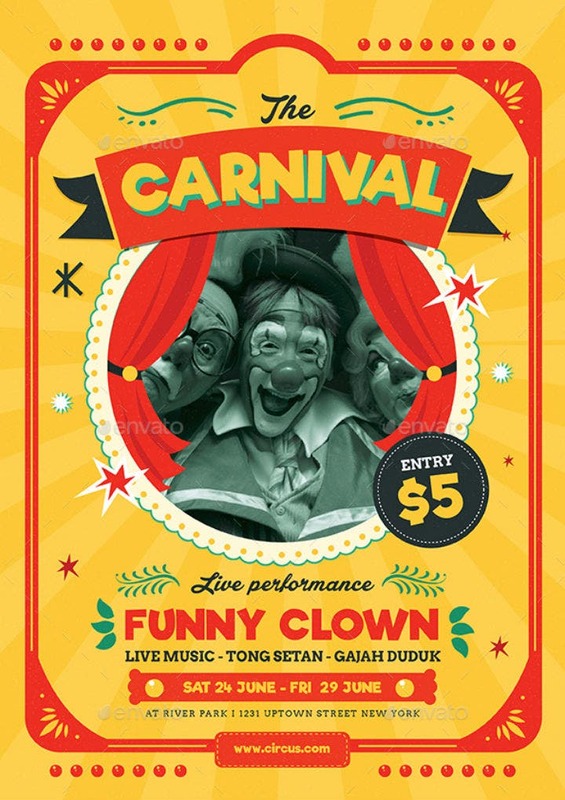 Even if only minimal editing is required for those who use pre-made carnival party invitation templates, the repeated exposure to different graphic design software tools can still help enhance one’s editing skills. This is a good thing especially if you are interested in graphic design. Learning how to use different image editing and desktop publishing tools will also allow you to learn a new set of marketable skills. And if you continue honing these skills, you may even start a side hustle that will allow you to earn more money. Learning how to use different graphic design tools will also allow you to create your own graphic design projects in the future. This is an important skill to learn for entrepreneurs as a way to save money and to better express their business branding designs. And that’s it! 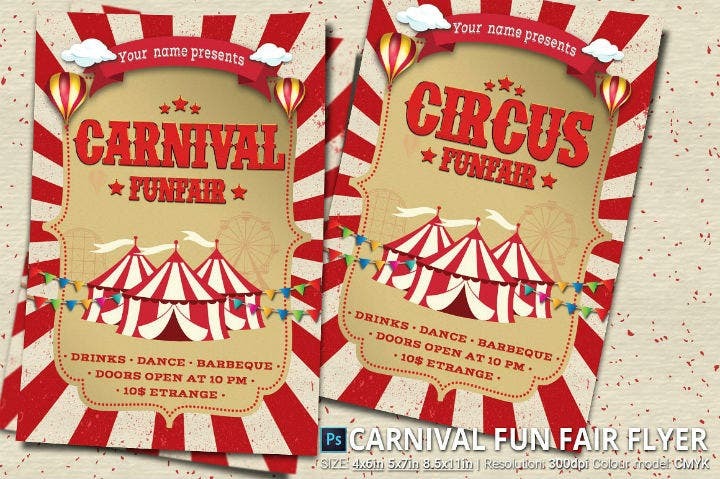 The top benefits of using pre-made carnival party invitation cards templates. We hope that you were convinced enough to try out using any of the different party invitation card templates and designs we have featured in this article. And, do not forget to have fun planning your carnival-themed party! You may also see potluck party invitations. 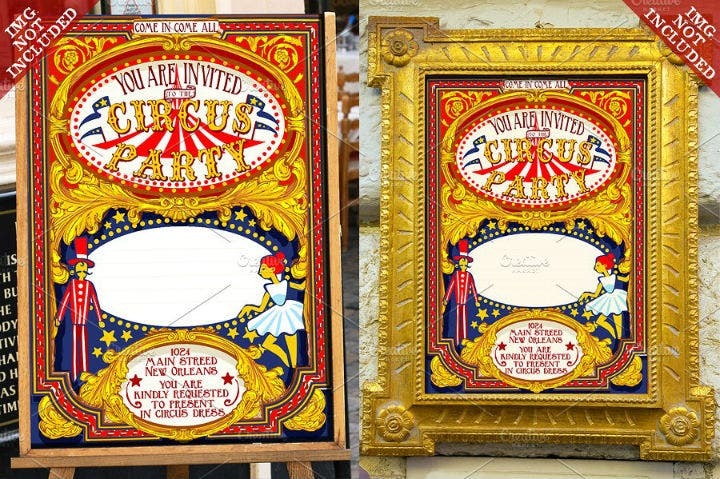 What Carnival Party Invitation Template Have You Chosen? The different examples of invitation card templates embedded above can all work for any kind of carnival party for anyone. It does not matter whether the party is for a child, teenager, or grown adult as these invitation card templates can easily be personalized or kept as they are. These universal invitation designs will allow you to make the best use of these templates without affecting the overall feel or ambiance of the party that you are planning. 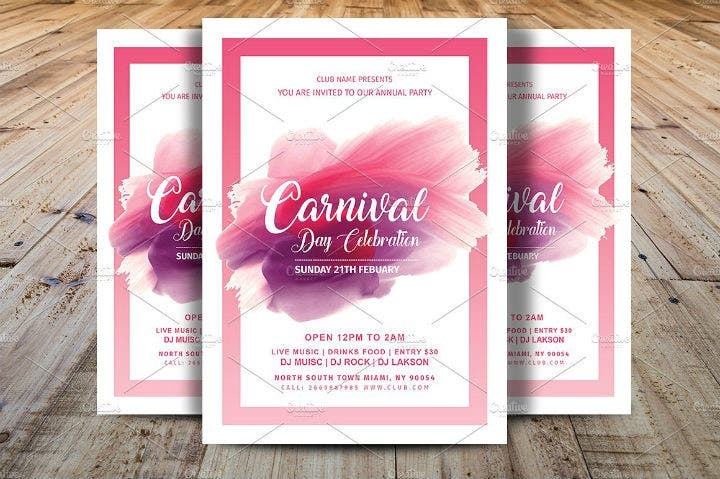 If you are still undecided on what specific carnival party invitation template to use, feel free to browse through the site for more party invitation template design ideas. There are hundreds of other party event invitation templates here so you will surely find one template design that will suit your party needs. Found this list article useful? If yes, we would appreciate it if you share the article with your friends, relatives, and colleagues through email or through social media. Thanks again!